When Hitman: Agent 47 fails at the box office, one could, and will, argue the case that Hitman: Agent 47 didn’t fair well because R rated films have fallen out of fair with audience. However, this couldn't be further from the truth. Hitman: Agent 47 failed because of a weak script created by a studio hack that has a track record of horrible films. Creating a film based on a video game property is a tough sell to audiences. In fact, there have been very few films that financially have accomplished this. Now, this August, 20th Century Fox tries yet again to translate the video game franchise Hitman to the silver screen with Hitman: Agent 47. If you aren't familiar with the Hitman property or Agent 47 before the film, don't worry the plot is pretty simplistic. A covert organization has found the way to create the perfect assassin; someone who has faster reflexes than an ordinary human being, thinks smarter, and is all around the perfect weapon. Fearful of what they had done the organizations creator, Litvenko (Ciarán Hinds; Lara Croft Tomb Raider: The Cradle of Life) destroys his work and lives life on the run. Fast forward to pedant time — A new organization called the Syndicate has sprung up, trying to replicate the work of Litvenko. Headed by Le Clerq (Thomas Kretschmann; King Kong), they will stop at nothing to achieve it's goal; however, neither will Agent 47 (Rupert Friend; Homeland) in trying to stop Le Clerg. If you kept up to speed so far with the plot, wait, there is more. To top this off — throw in a girl, Hannah Ware (Oldboy), and a sympathetic looking mystery man (Zachary Quinto; Heroes), and ready, set, go! You have a movie. If this simplistic, yet overly convoluted, plot doesn't make too much sense, don't worry, neither does the film. It tries to be overly smart, while not having any semblance of a story. The story trudges along from scene to scene moving all the pieces in place for just the sake of moving them. Then, we are greeted with actors spouting meaningless dialogue (that a four year old could probably make sound better), making one feel, at times, that the movie might have done better as a silent film. Although, what else would you expect from Skip Woods, the screenwriter of such catastrophes such as X-Men Origins: Wolverine, A Good Day To Die Hard, The A-Team, and the original 2007 Hitman film. While the screenplay and story destroyed any chance for Hitman: Agent 47 to be a good film, that is not to say that there were not other aspects of the film that held great promise. First time commercial director, Aleksander Bach, does an adequate job with the film, lensing some great action scenes and composing the the rest of his wide-angle and close up dialogue shots nicely. His direction fits perfectly into this kind of film, slick and fast. Hopefully, studios can see past the issues of Hitman: Agent 47 to realize he would be a valuable asset to them in the future. Rupert Friend was an unexpected, but good, choice to portray the film's lead character, Agent 47. Through his mannerisms, he adds depth to the character that the story left out. His performance is miles ahead of what audiences were given with Timothy Olyphant's (Scream 2) wooden performance of Agent 47 back in 2007. Hannah Ware also tries to put as much effort in her performance as possible with mixed results. At times, she seems comfortable in her portrayal of Katia and other times she seems to be just looking off camera for some help on why her part is written so poorly. It is with utter disappointment that Zachary Quinto phoned in his performance as arrogant villain, John Smith. He could have given the character so much more depth and charisma if he only let his character Sylar, on Heroes, be his inspiration. When Hitman: Agent 47 fails at the box office, one could, and will, argue the case that Hitman: Agent 47 didn't fair well because R rated films have fallen out of fair with audience. However, this couldn't be further from the truth. Hitman: Agent 47 failed because of a weak script created by a studio hack that has a track record of horrible films. If you give audiences a smart, witty action film that is rated R, they will come in droves. Maybe with the next Hitman reboot, the studio will finally get it right. Download Hitman: Agent 47 from the iTunes Store in Digial HD. 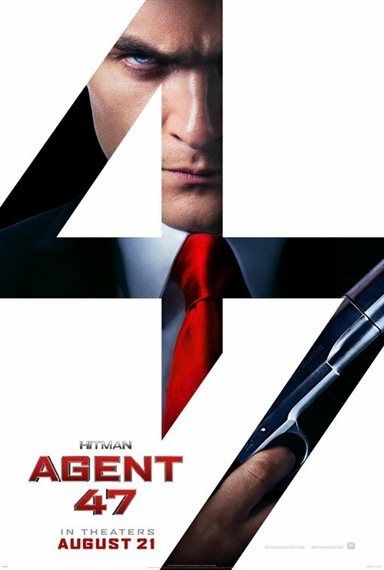 For more information about Hitman: Agent 47 visit the FlickDirect Movie Database.